To win this gift certificate, all you have to do is sign up to follow the new store blog between now and Feb. 16. The winner will be announced here on Feb. 17. This blog will be up during the transition and then it will go bye-bye! FOLLOW IT FOR CHANCE TO WIN!!! Crafter's Companion is coming out with four completer sets for the already available 72 markers. This brings the complete set to 168 colors. Completer sets are available in BRIGHTS, DARKS, LIGHTS and PASTELS. Each set contains 24 markers. PREORDER NOW! Product expected to ship from 7 KIDS to you in early April. I have ordered the refills for the first 72 colors. Look for those in the store soon. DT member Rhea Weigand has all available Spectrum Noir markers and will be doing work with them on her blog. If you are interested in seeing what these markers are capable of, visit her blog soon. All DT members blogs are linked on the store blog and the challenge blog for links to them and their great projects! There are 14 new La-La Land Crafts stamps (10 Marci & Luka, 4 accessories) in the store now for preorder. These stamp are shipping very soon. Order today to make sure you get the stamps you want with my first shipment. These stamps are so sweet and perfect for coloring with any alcohol ink marker! Head over to the blog for the current challenge: RED, PINK, and WHITE. Please remember: in order to win the $20 store gift certificate or be picked for the top three places, your stamped image MUST be an image sold in the store. If your card is primarily a papercraft, please make sure it includes dies or paper carried in the store. This is the first challenge where our newest DT member PAT FRANK is joining us! Please visit the challenge blog to see her submission and Pat's personal blog to see her great work and welcome her! 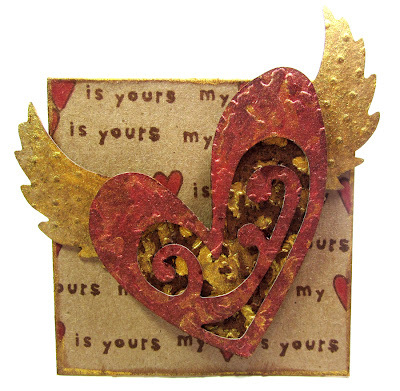 Spellbinders has released tons of new dies at CHA. There are great decorative nestabilities, tons of shapeabilities and the great new line Cut, Fold & Tuck Dies. Check them out now! Also in the store for preorder are the new M-Bossabilities. These are double sided embossing folders. Two designs for one price. Awesome! Look for more items in the store tomorrow. This is an exciting time! AUCTION ENDS TOMORROW! BID NOW TO SUPPORT A GREAT CAUSE!!! Stampavie has released 75 new stamps from Sarah Kay, Penny Johnson, Tina Wenke and their new artist Suzi Blu. Check them out. PREORDER NOW for shipping in mid to late February! JUST A FEW DAYS LEFT! DON'T MISS YOUR OPPORTUNITY TO GET TONS OF EMBELLISHMENTS AND SUPPORT A GREAT CAUSE!!! I have about 50 packages of embellishments and stamp sets left over from the Basic Grey clearance that I have consolidated into one big package! I have decided to "auction" it off to the highest bidder in an effort to help jump start a new non-profit organization. Many of you are familiar with the non-profit I have been supporting over the years called Singleton Moms. One of the founders has recently moved to Portland, Ore. and is starting up a similar program in her new area. This organization is called Singleton Love and will be providing similar services to single parents undergoing cancer treatment in the Portland area. They are in the preliminary phases, are applying for their 501c3 status and looking for their first parent to sponsor. I'd like to help with some of the needed seed money, so all proceeds from this auction will be sent to this fledgling organzation. Of course, as usual, I will come home with lots of goodies from CHA and will be raffling prizes to support Singleton Love in February! Be part of getting this awesome organzation off the ground! The GRAB BAG is worth over $250 and includes embellishments and stamps from Basic Grey. I will also throw in a few other goodies. In all, you will receive 50+ items! To bid on this package, please just comment on this post with your bid and your e-mail address. At the close of the auction, I will contact the winning bidder and let you know how to pay for your prize! Shipping to a US address is included in your bid. If you are an international customer and are interested in bidding, please contact me for a quote on additional shipping costs should you win the grab bag. 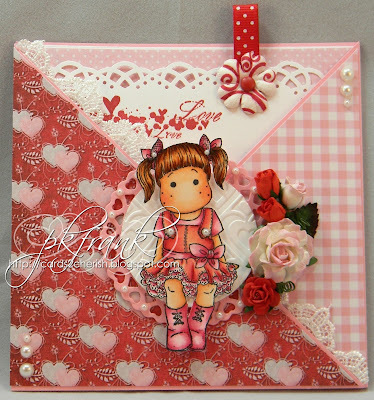 An adorable Tilda card made by DT member Lisa Summerhays using The Magnolia image, Tilda with Arrow. To find out more about Lisa made her card click HERE to visit her blog. The following GRAB BAG is worth over $250 and includes embellishments and stamps from Basic Grey. I will also throw in a few other goodies. In all, you will receive 50+ items! To bid on this package, please just comment on this post with your bid and your e-mail address. At the close of the auction, I will contact the winning bidder and let you know how to pay for your prize! Shipping to a US address is included in your bid. If you are an international customer and are interested in bidding, please contact me for a quote on additional shipping costs should you win the grab bag. Here a few projects using various distressing techniques by DT members Julie Glasgow and Marlena Peduzzi. Julie used a variety of distress inks on her beautiful image, Tilda with Lamb. She used her paintbrush and distress inks and the combination was just amazing. Check out her beautiful card below. To find out more about how Julie made her card, click HERE to visit her blog. Marlena also used distressing techniques on her card. She used copic markers and her distress ink pads on her image, Magnolia, Ice Tilda and the rest of her card. See her project below. To find out more about how Marlena made her card click HERE to visit her blog. Head over to the challenge blog and enter your card to win a $20 gift certificate. The current challenge is LOVE IS IN THE AIR featuring 3X3 cards perfect for Valentine's Day. Pin Cushion: 1⅞ x 1⅞"
Dress Form: 1 x 2⅞"
Star LG: 1⅞ x 1¾"
Star SM: ⅞ x ¾"
Heart LG: 1⅛ x 1⅛"
Heart SM: ⅜ x ⅜"
4 Petal Flower LG: ⅞"
Round Tag: 1¼ x 1"
Rectangle Tag: 1¼ x ⅞"
Spellbinders™ Paper Arts invites you to join us in a sneak peek of the most innovative die cutting, embossing and stenciling products to date! The Spellbinders Abilities and Beyond Blog Frenzy begins January 12, 2012 and will last through January 20, 2012. It previews of some of our newest 2012 Winter Craft and Hobby Association (CHA) Conference and Trade Show releases each day through our talented Designers' Blogs. Click on to each Designer's name to be inspired by their beautiful creations with today's new releases! Oblong Accent: 1⅝ x 3"
For official rules visit the Spellbinders Blog. Starting January 29, 2012, Spellbinders 2012 Winter CHA Releases will be available to order. Corner SM: 1⅜ x ⅝"
Corner LG: 1¾ x ⅞"
Tea Pot: 3⅝ x 2¼"
Tea Bag: 1 x ⅝"
Tea Bag Tag: ⅜ x ½"
Flowers: 1 1/16 x 8"
Scalloped and Swirls: ⅝ x 8"
Sizes Range from Sizes Range from ¼ x ⅜" to 1½ x ⅜"
Scalloped Oval: 1⅛ x ⅞"
Flower and Leaves: 1½ x 1⅝"
This discount will also be increasing over the next few weeks. A new project by DT member Darsie Bruno using the image Miss Rosalie with Roses. To find out more about how Darsie made her project, click HERE to visit her blog. And here's another project by DT member Lori Leng. Lori used Spellbinder's Label 20 to make her project. To find out more about how Lori made her project click HERE to visit her blog. Our Design team has been very busy. This is a project by DT member Rhea Weigand using the Tim Holtz die, Caged Bird. To find out more about Rhea has mae her project click HERE to visit her blog. A "crafty" sign by DT member Marlena Peduzzi using the Kraftin' Kimmie image, The Krafty Stamper. To find out more about how Marlena made her project click HERE to visit her blog. Classic Triple Scallop Edge: ¼ x 8"
Classic Bracket Edge: ¼ x 8"
Classic Petal Edge: ¼ x 8"
Triple Scallop: ⅞ x 8"
Classic Scallop Edge: ¼ x 8"
Classic Postage Edge: ¼ x 8"
Classic Ric Rac Edge: ¼ x 8"
View this newsletter online! Click here to view. With brand new products coming out at CHA, I am clearancing out all Prima products that are no longer available to purchase from Prima. I have moved almost all Prima products currently in the store to the RETIRED section. This will be another graduated sale to clearance out. Stay on the lookout for increased discounts. All Basic Grey in the retiring section is now 30% off. Grand Goddess: 9½ x 4¼"
Small Goddess: 6 x 2¾"
Heart LG: 1⅞ x 1¼"
Heart SM: 1½ x 1⅛"
Coil SM: ¾ x ⅝"
Coil LG: ⅞ x ¾"
Triangle/Trillion SM: 1½ x 1⅜"
Triangle/Trillion LG: 1⅝ x 2⅛"
CC Designs Kiki LaRue by DT member Darsie Bruno. To find out more about how Darsie made her project click HERE to visit her blog. And, Belles and Whistles Ice Cream Butterfly by DT member Rhea Weigand. To find out more about how Rhea made her project click HERE to visit her blog.